From a lookout on the east side of the valley we found Ol One Ear and about twenty head, a mile across the valley on the top of a rocky ridge. They were far enough away to make it hard to find him standing in the shade. We were sure glad to see he hadn't left the country. Ol One Ear looks like he hasn't been getting "three squares per day." He looks a little better from this side. Would you call these two Carmellos or Palominos? I think One Ear can claim both of them on his tax return. This mare ran with the main band from birth until about six weeks ago. The other side was more of a jump than he wanted to chance. This paint mare has been running with this band for five or six years. Lots of chrome on this colt. He's been on here before. Cool pictures with them "On the Rocks"
Glad you found ole One Ear. He isn't roly poly fat, but he looks to be okay. How old do you suppose he is? Thanks again for taking us along. That last one is a sharp looking horse. Old One Ear sure cuts a different image with that empty space above his head! 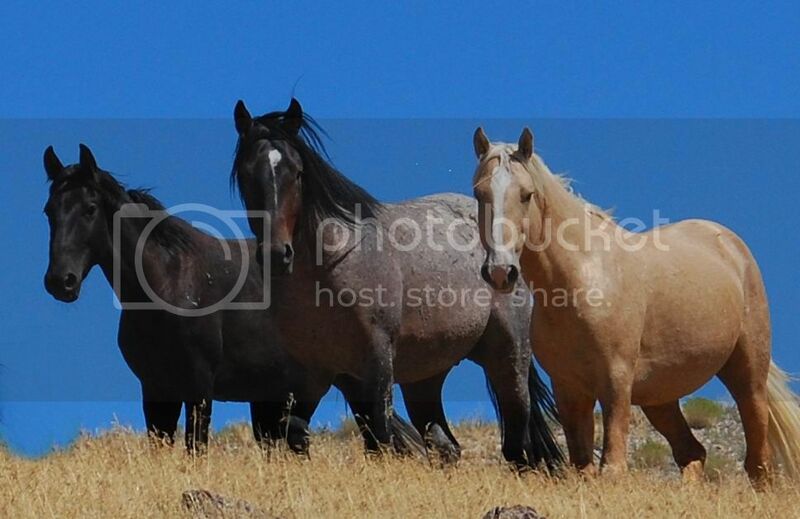 As for the color of those colts, could they change much yet since they're still fairly young? Nice pics again, thank you for posting. The first picture I have of him was taken in 2011. From the picture I'd guess he was four or five then. So maybe he's around nine. He sure dresses up that band of mustangs. He must be one tough old cuss.